The RYME+ project is now facing one of the last trade missions foreseen in the methodology designed for the support of the internationalization of companies located in the South West European Space (SUDOE Area). 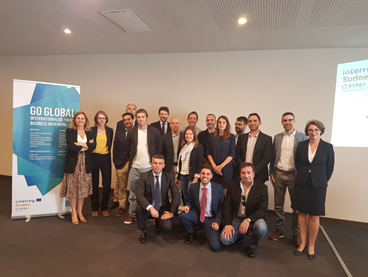 In this occasion, a delegation of ten technological companies from Spain, France and Portugal had the opportunity to explore one of the most relevant markets of the LATAN Area: Uruguay. That is why the CEEI Asturias, partner in charge of organizing this mission, coordinated the work for the design of a complete agenda of activities so that the participating companies could know how the Uruguayan business ecosystem works by means of the most important local agents and supporting entities and establish consortiums with companies from this territory. To facilitate this task, CEEI Asturias organized a welcome seminar in which the most relevant local authorities took part such as Mr. Jaime Lorenzo, Economic and Commercial Counselor ICEX from the Embassy of Spain in Montevideo, Mr. Andrea Nicolaj, Head of Trade and Economic Section, EU Delegation to Uruguay and Mrs. Laura Di Giovanni, Head of the Cooperation Unit at ANII presented their vision about Uruguay as an attraction business focus. Cristina Fanjul, managing director of CEEI Asturias, completed the participation presenting the RYME+ methodology to the audience. In addition to the foreseen institutional visits to the following entities: Scientific And Technological Park Of Pando, PASTEUR INSTITUTE, ANII-Innovation and Research National Agency, LATU- Technological Lab of Uruguay and INGENIO as incubator, CEEI Asturias and its collaborators paid especial attention to the configuration of the B2B meetings carrying out a detailed selection of companies in Uruguay that could be considered as the international partners that the companies from SUDOE were looking for. •	90 % of the companies could start business collaborations with companies from Uruguay, almost 2 entities per each SUDOE company. o	TESIS MEDICAL SOLUTIONS – HOSPITAL ASOCIACION ESPAÑOLA. In this case, TESIS has managed to sell its software for rehab departments and integrate it the structure of the hospital. The budget (100.000 €) has already been approved by the board.